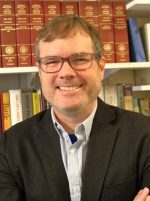 The University Press of Kansas (UPK) is pleased to that announce Bill Allison has been named the new editor of the acclaimed Modern War Studies Series. Allison is an accomplished scholar of American military history, specifically the Vietnam War, and a professor of History at Georgia Southern University. Initiated in 1986, UPK’s Modern War Studies series publishes several books each year in military history, from the mid eighteenth century to the present. More than 250 titles have been published in the series, and series books have been awarded prizes by the Society for Military History, Marine Corps Heritage Foundation, Naval Historical Foundation, Army Historical Foundation, Air Force Historical Foundation, Organization of American Historians, and American Historical Association, among others. Allison earned his BA and MA in History at East Texas State University in 1989 and 1991 and completed his PhD in history at Bowling Green State University. His academic work is complemented by his accomplished writing career. He is author of The Gulf War (Palgrave Macmillan, 2012), My Lai: An American Atrocity in the Vietnam War (Johns Hopkins University Press, 2012), Military Justice in Vietnam: The Rule of Law in an American War (University Press of Kansas, 2007), and American Diplomats in Russia: Case Studies in Orphan Diplomacy, 1917-1919 (Praeger, 1997), and is co-author with Janet Valentine and the late Jeffery Grey of American Military History: A Survey from Colonial Times to the Present (Pearson, 2013), among other works. Allison has presented and lectured at numerous conferences and universities, including Oxford, Cambridge, the University of Zurich, the Australian Defence Force Academy, the US Army Heritage and Education Center, and the USAF Air Command & Staff College. He is a former Trustee and Vice-President of the Society for Military History and has served on the editorial board of the Journal of Military History as well as editor for Routledge’s Critical Moments in American History series. Allison has served as a visiting professor at the United States Air Force Air War College, the University of Utah, the United States Army War College, and other institutions. Allison plans to hit the ground running. Born and raised in Texas, he lives in Spartanburg, South Carolina, with his wife Jennifer (Registrar – Wofford College) and three-year-old black lab Tucker.